Elliott Dewey started his hockey life in Basingstoke with the Junior Bison in 2006 but, after becoming an under 11 conference player in just his second season, he followed his then coach Lee Ealey-Newman to Slough in 2009/10. Over the next four years he would compete for the Jets at under 16s level with the ‘stay at home’ defenceman managing 62 appearances whilst notching 17 goals and 19 assists in the process. He would also make his mark for the under 18s in 2012/13 – 6 points coming from 14 fixtures – before a return home to Basingstoke came the following season. Just last term the blue liner then faced the biggest test in his career so far – appearing for the Junior Bison 11 times at under 18s level, playing all but 2 of the Buffalo’s 22 league fixtures in the NIHL South Division 2 and also dressing for the EPL’s Basingstoke Bison a total of 7 times. His impressive performances led to him being selected for the EIHA South West Conference side – the South West team one of five regions picked to showcase the Great Britain’s best young talent and Dewey winning the Hull based cross-regional tournament with his teammates at his age range. 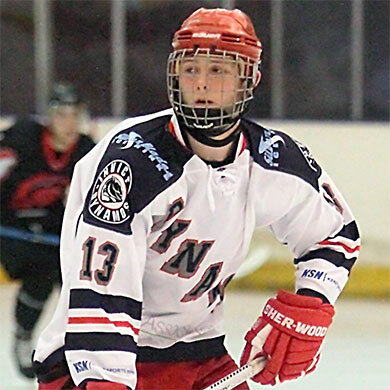 Now the promising defenceman will make the Silver Blades his home in 2014/15 as he looks to continue his speedy development in the NIHL South’s top tier. “Elliott actually trained with us last season and he showed plenty of promise in each of the sessions. On top of this he has done very well for himself at junior level having played for a successful South West Conference team in 2013/14 and I’ve had nothing but positive feedback come back from his coaches. I’d best describe him as an out and out ‘stay at home’ defenceman who possesses a very good positional sense and I look forward to him bringing that talent to the team in 2014/15. It is undoubtedly a big year for Elliott but he has the ability to make this step to becoming an NIHL South Division 1 regular and I already know he is determined to seize this opportunity with both hands”.